I'm having such a manic few weeks at the moment, due to lots of travelling and my law finals coming up next week! Aarghh! Positive vibes! So because I've done lots of revision/work and needed a little bit of motivation so close to the end. I set myself a little revision task and for completing that task I bought myself a reward! (Any excuse!) And my reward came in the form of a treat from the High Life magazine on the plane. I bought these Jo Malone mini scents. I thought what better way to try different scents, which you wouldn't usually choose! These are so light and fresh, which makes me even more insanely excited for summer! I think my favourite one right now is Orange Blossom, but that's likely to change because to be honest I love them all! I'm going to need someone to restrain me from buying the full size versions of them all! 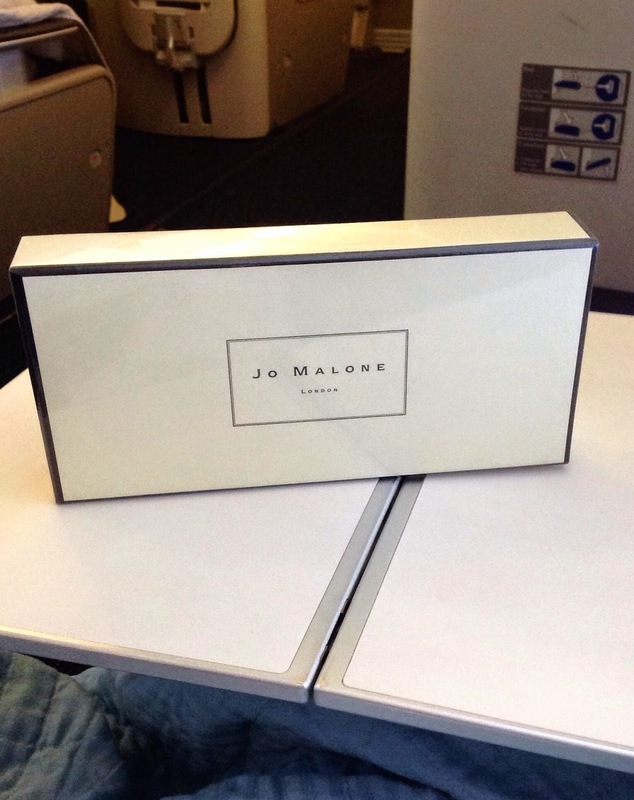 Have you tried Jo Malone colognes/ have a favourite scent? It's the weekend! What better way to start it, than showing off a new lipstick! Today surprisingly it's another pink! It's a NYX butter lipstick! I am partial to a Revlon Colorburst Lip Butter lipstick, so I'm a tad excited to see if this matches up to its moisturising butteriness! (Sorry for making up random words, but I think this one is a pretty good word!) Haha! This lipstick is in the shade BLS14 Taffy. Even though it's a pink, there's definitely a purple/mauve tinge to it! I didn't realise quite how bright it was when I bought it! I kind of get a bit too excited and get into full on lipstick mode. However this lipstick is definitely a lovely texture. It does kind of have that melting feeling when applied to your lips. So that makes it very very moisturising, plus it's highly pigmented too. All in all the best combo. The colour softens when applied, but it is still a pretty bold shade. I think it's lovely for summer, to add that extra little 'ing' to your makeup look. I'm definitely impressed by these and I'm going to snap up some more NYX butter lipstick shades, most likely in more neutral everyday shades. 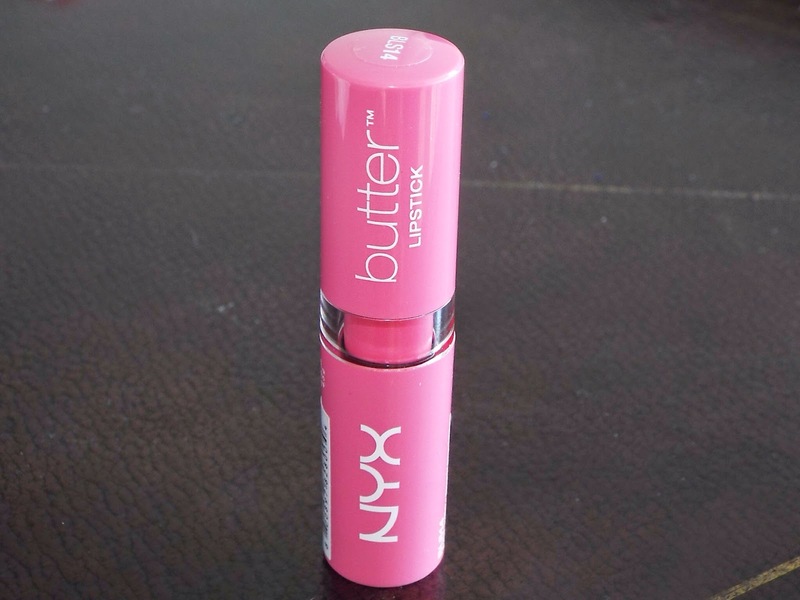 Have you tried NYX Butter Lipsticks? I'd love to know your thoughts on them and any shades which you would recommend. After having a little root around the drugstore! Well actually quite some time in the drugstore! I came across a colourful stick of blush! 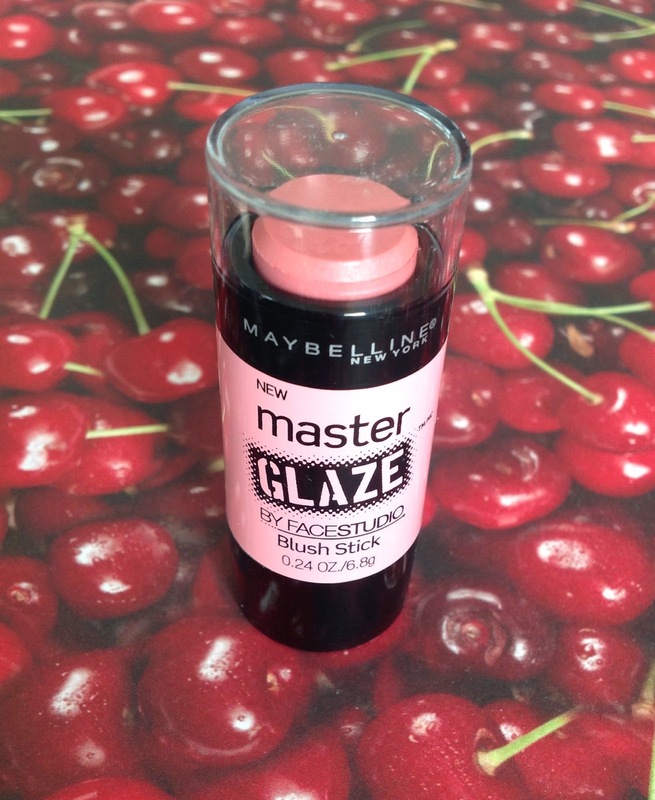 Oh yes this Maybelline Master Glaze blush stick begged me to pick it up! I did in shade 'Pinch Pink'. It definitely reminded me of the No7 pop and glow sticks that I've already written a post on! So I just couldn't wait to see if these were in the same blush field. These Maybelline Blush sticks come in variety of colours, perfect for any blush lovers! I chose this one, because I'm just addicted to pink blush, and I have sooo many lipsticks this shade, so totally matching my makeup there! Here it is swatched on my hand! It feels quite wet when first applied, but when blended it kind of melts away, feeling somewhat powdery! It is very subtle when blended, and has lots of little sparkles which reflect when they catch the light. I love how light this feels on your skin. I would say this shade is definitely great if you're going for a subtle makeup/no makeup look. Otherwise if you need some more colour on your cheeks, a different shade will probably be more helpful. I think this could be my favourite drugstore blush to take me through summer. For me it definitely beats the No7 Pop and Glow sticks, and the size of Master glaze means it's super easy to be added to your handbag makeup stash! Have you got a favourite drugstore blush? 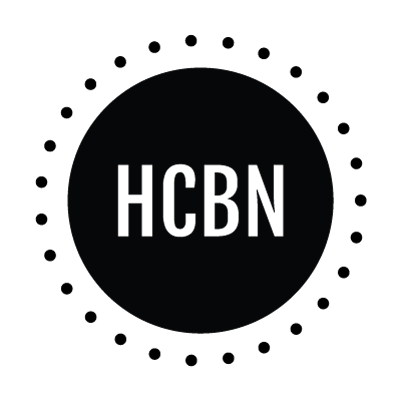 I thought I'd do a post a little different this week! And share some hearts for what I'm hearting! Basically it looks like my loves this week are beige and pink! 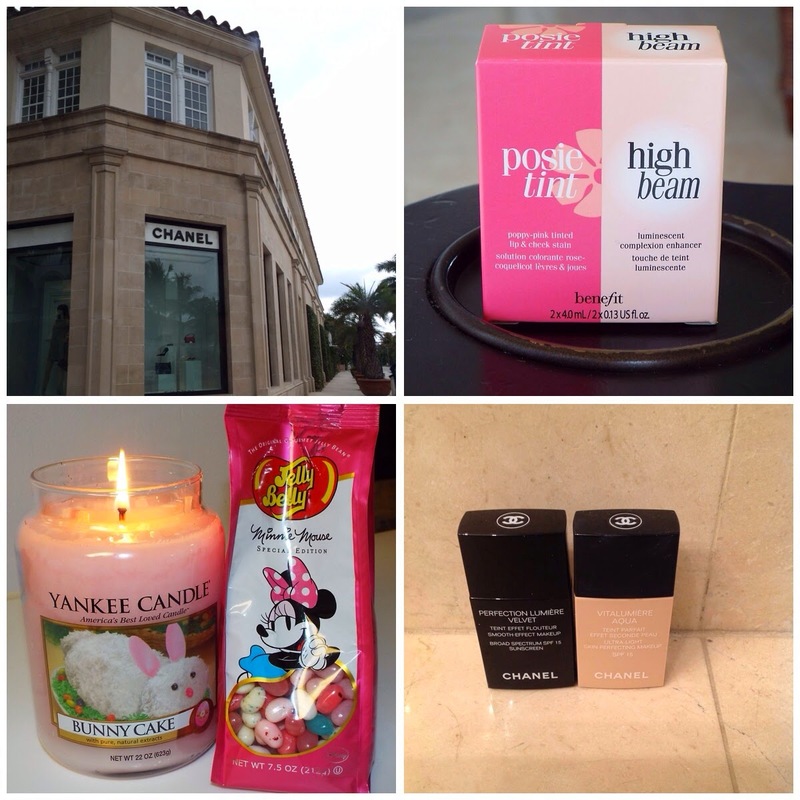 Starting off top left is the Palm Beach Chanel shop, it's basically heaven! I wish I could live in it! Then top right we have a little revision treat my mum gave me! Uni finals are draining so a little mini combo of posie tint and high beam cheered me up! Total motivation to study! I'll be doing a review on these soon! Carrying on bottom right are my Chanel twins! The Chanel Perfection Lumiere Velvet foundation and Chanel Vitalumiere Aqua! I always use the Vitalumiere Aqua as I have quite dryish skin, but I couldn't resist giving the new velvet foundation a go! So this little black beauty will be being reviewed soon, but its velvet feel is definitely impressing me right now! I visited a yankee candle outlet store and snapped this Bunny Cake large candle up for $13,99, I think they call that a bargain! And then Minnie Mouse jelly beans! Need I say no more! Hope you love my hearts this week! What are you loving? I certainly hope your Good Friday is good! My Friday is full of Strawberry Milk! Not the real strawberry milk, because I'm definitely not a milkshake fan! 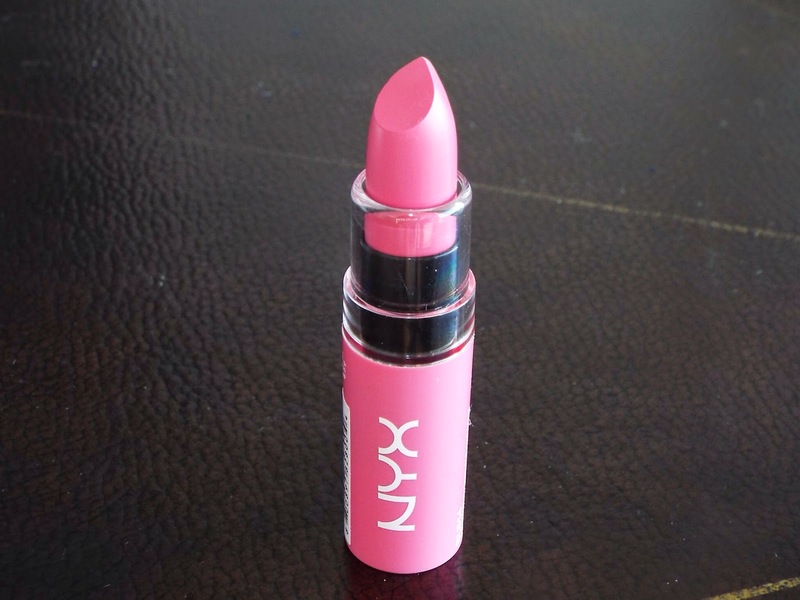 But a beautiful NYX Strawberry Milk full Friday! 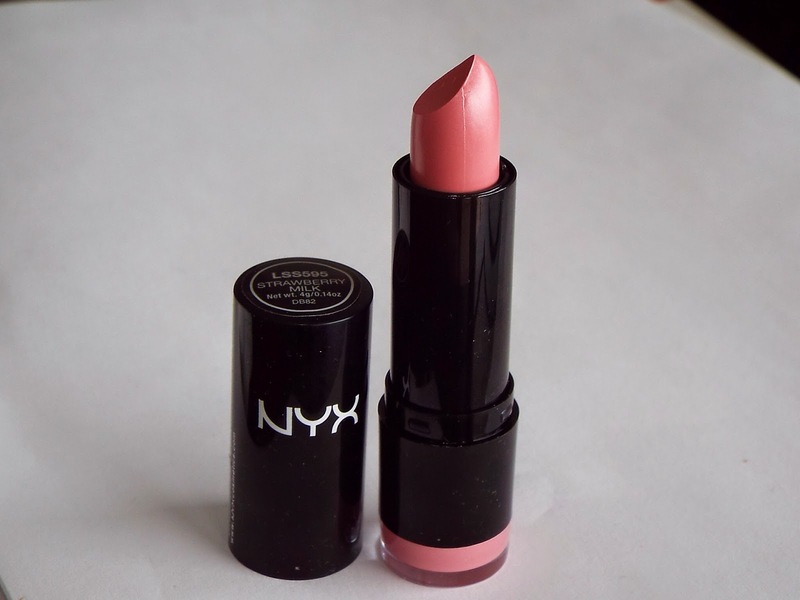 This is one of NYX extra creamy round lipsticks! In a baby pink shade called Strawberry Milk! It's a classic girly shade, since I seem to be indulging in quite a few other pink things, one more wouldn't hurt! This lipstick consistency is kind of a bit like melted butter for me! 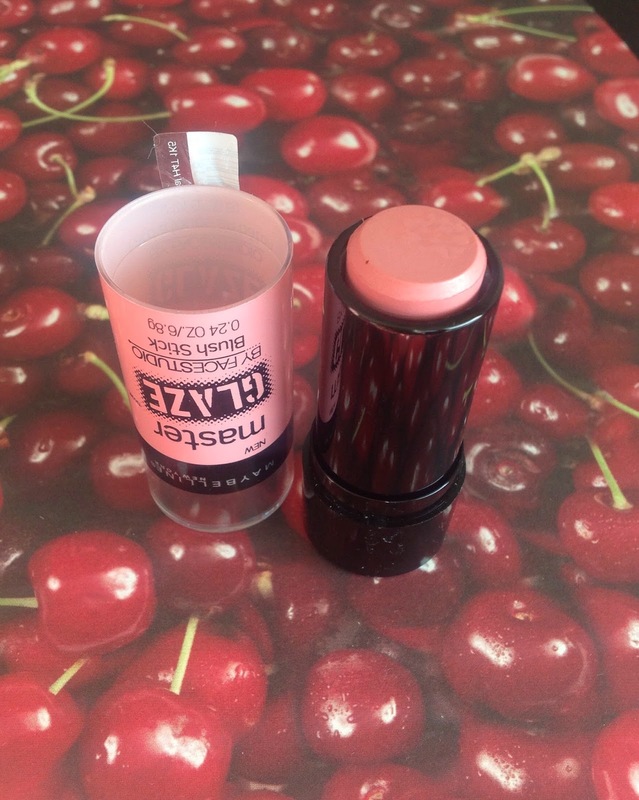 It glides on really well, but I feel like you have to keep on applying it because even though it's creamy, it kind of acts a bit sticky, and shows your little lip cracks! However after smoothing it around, it's fairly good! The colour is pretty, a beautiful light pink which still has a little bit of oomph! I think if I were to create a pink category for it, it would definitely be a 'princess pink'. One thing which I didn't expect was my lips felt and looked a bit bigger, now I don't think it has any plumping properties so I'm not too sure how this happened! But as I barely have a top lip, any enhancement is a plus! Overall it has its good points, namely it's colour and pigmentation, but I'm not too much of a fan of its texture and way it looks once applied! It's a decent little number if you're after a drugstore cheap pop of pink, but I won't be betraying my MAC lipsticks for it! Have you tried Strawberry Milk? Or can you recommend any NYX lipstick shades? Now I'm not going to hide the fact that I'm a sucker for a blush! And I'm an even bigger sucker for a super reasonable blush! 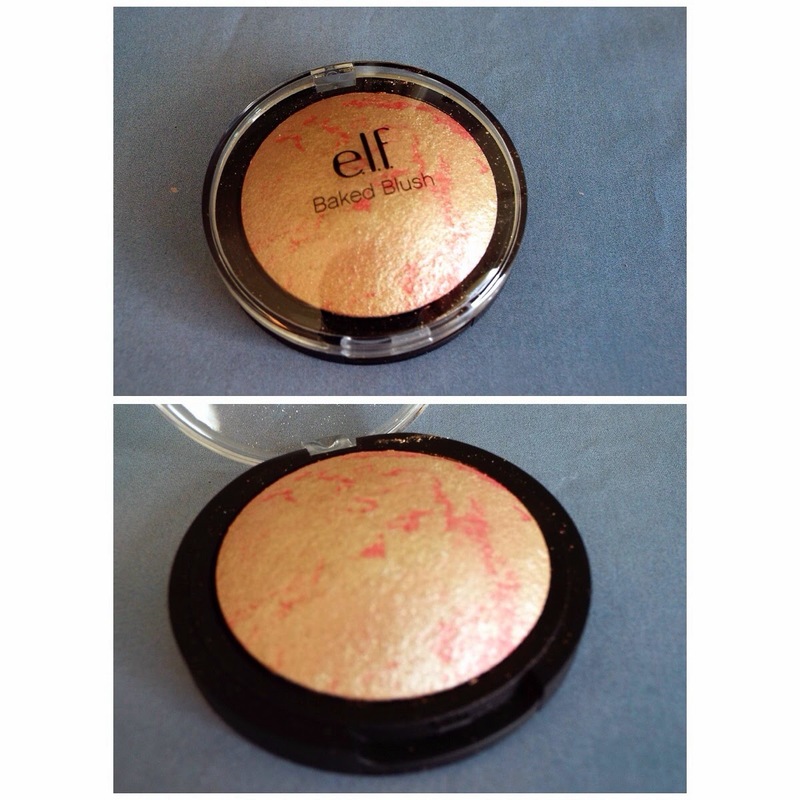 This week I came across e.l.f baked blush in the shade Pinktastic! With a name like this, it would have been rude to not pick it up! Once I picked it up I saw the lovely gold champagne colour with pink swirls on this blush. Just like a golden raspberry ripple! At $3.04 it just had to be mine. And it was. It's not so much your usual blush but a lovely shimmery highlighter kind of blush. It is soooo subtle with the perfect amount of glitter. It's super smooth and really lifts when you pop it on. I'm super sure that it would be perfect for any skin tone, due to its natural look. For this price, I can't quite believe the great quality it is. If you're after a highlighter kind of blush definitely check it out! E.l.f baked blushes are definitely reminding me of MAC mineralize blushes right now, and are a teeny fraction of their price. 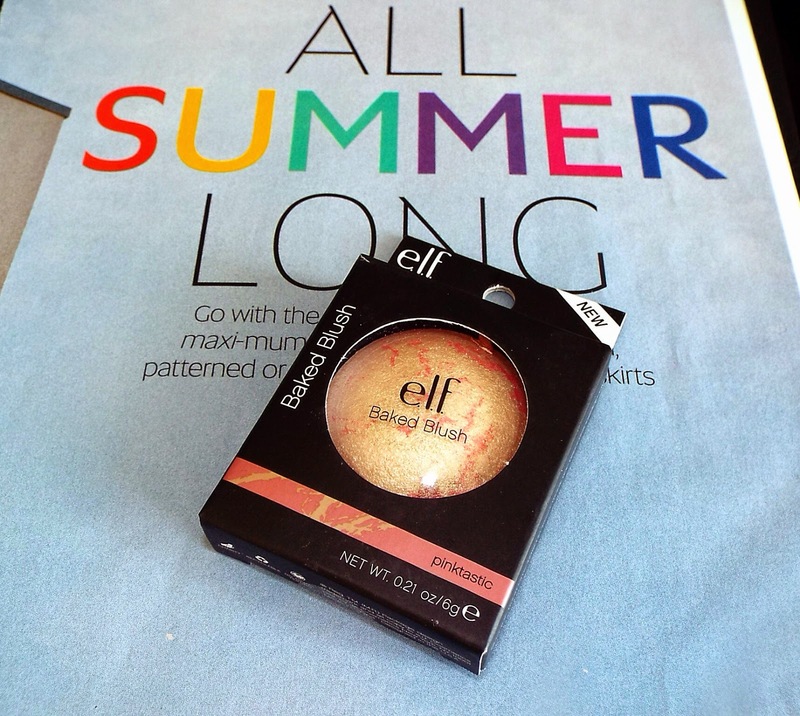 Have you tried e.l.f baked blushes? Now I know I've recently shown you a new addition to my lipstick collection! But I just have to share with you another, as I couldn't be a true lipstick lovers I didn't! 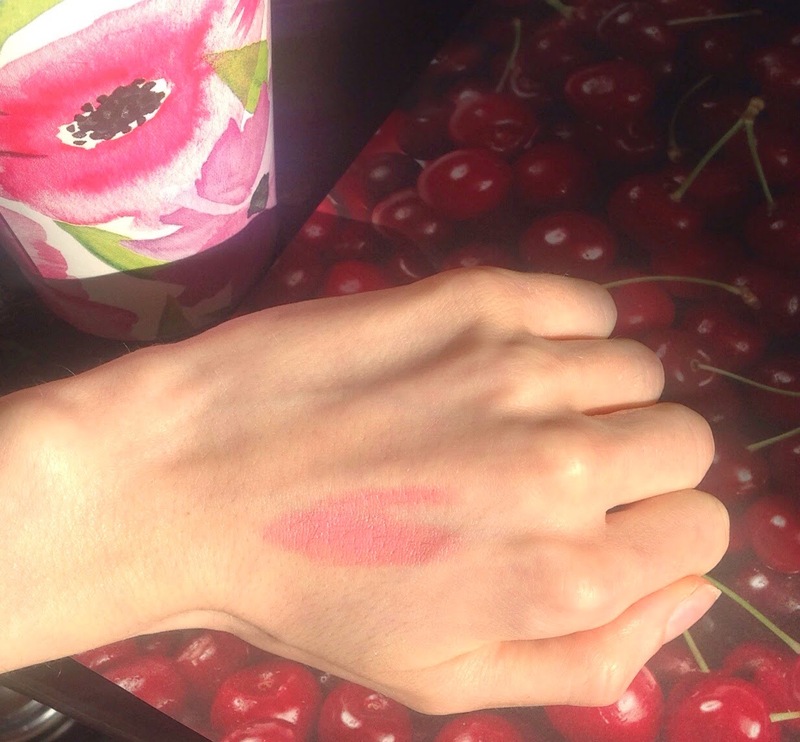 My beauty bargain today is a MAC Cremesheen lipstick! My favourite finish ever! The shade I've got is so so perfect for spring/summer! 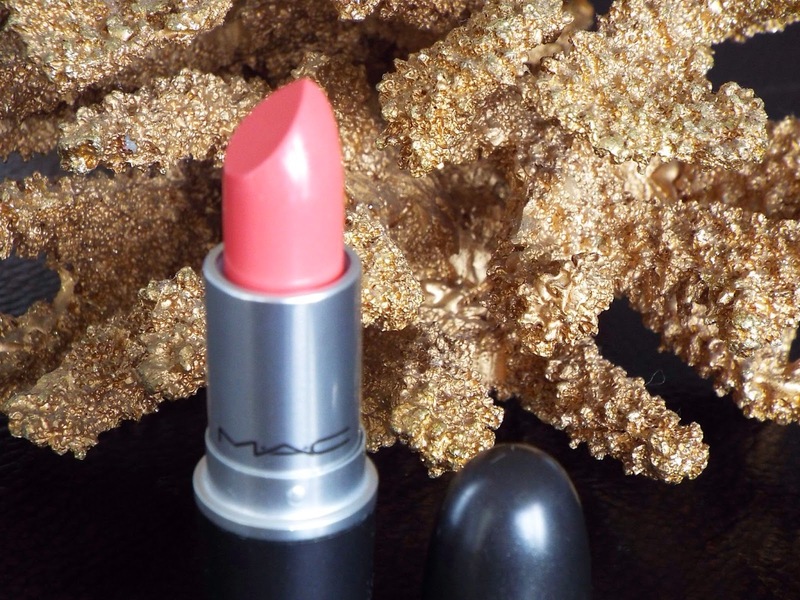 I was after MAC's Fleur d'Coral but when I went to buy it, it had sold out! I was so sad, but everything happens for a reason! And I found out why! At outlet prices, I was extremely happy. I found MAC Coral Bliss lipstick, it's a soft coral pink shade, and when you apply it, it's quite subtle so you can keep adding if you want more coverage! This shade is great for everyday and at an outlet price of $11.25 so like £6.80, it really was like I had landed in lipstick heaven! I am so happy with MAC Coral bliss, that my pink/coral smile is stretching from ear to ear! 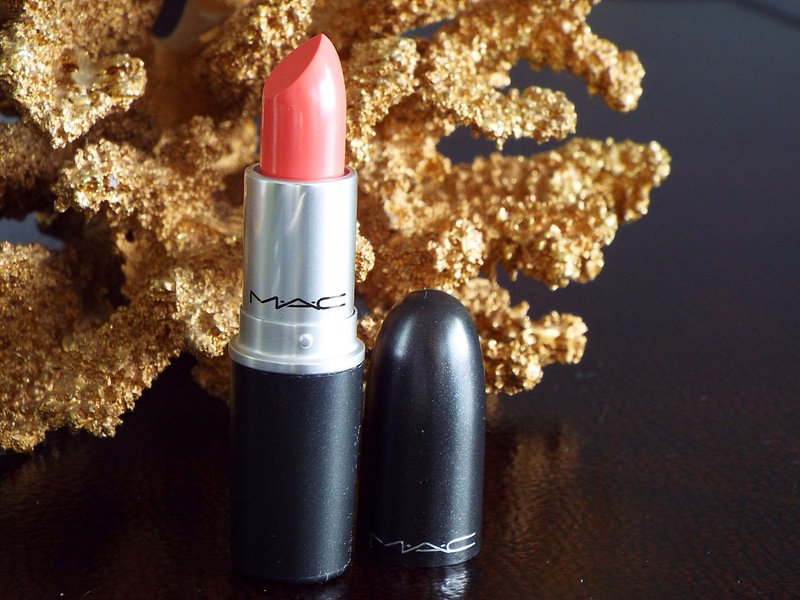 Have you tried MAC Coral Bliss? There's no better way to end the week than with a little treat for the weekend! And I have just the treat! Whilst I was waiting for my flight to New York I had to pass my time shopping in world duty free! Who am i kidding, I always almost miss my flight because I am too engrossed in the makeup section! I decided that I wanted a new lipstick, because a girl can never have enough lipsticks! I was staring and swatching my hand/arm to pieces for quite some while! Then I finally chose my little lipstick! This time I went for a MAC Satin finish in the shade Snob! It's described as being slightly mauve but to me it's a beautiful pink finish with hints of mauve. So so pretty! Usually I go for the Cremesheen lipsticks but I thought I should expand my collection into the Satin finish. It is a matte type lipstick, but I didn't find it too drying on my lips at all! Which is a shock because having just been on a plane my lips normally crack/chap making it super hard to apply matte lipsticks. Snob though has a really lovely feel and made my lips look lovely. Thumbs up for the great lasting power too! And man I am so glad I took my time in choosing this, because this lipstick is a gem! And my super new favourite! I can already tell that I won't ever be leaving home without it! 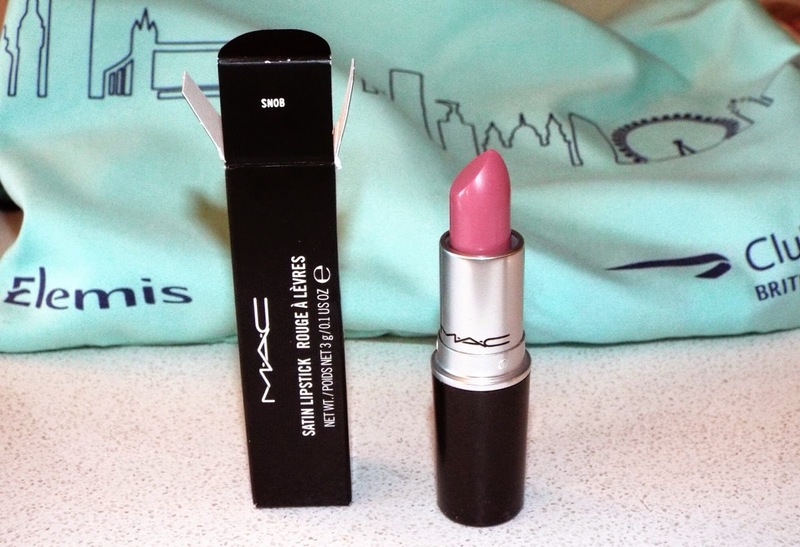 And with the duty free price of £12.50, it makes my lipstick purchase that much sweeter! Have you tried Snob before? 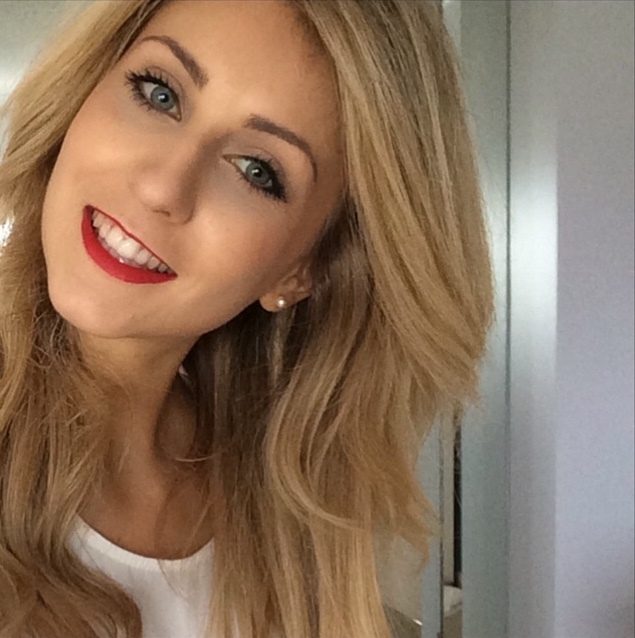 Have you got a favourite MAC lipstick? There's not much sun around here, so I'll try and bring you a little bit of sunshine on this rainy day! Over the weekend I was away, but when I arrived home there were 2 beautiful beauty packages to welcome me. I'll just show you the one today! 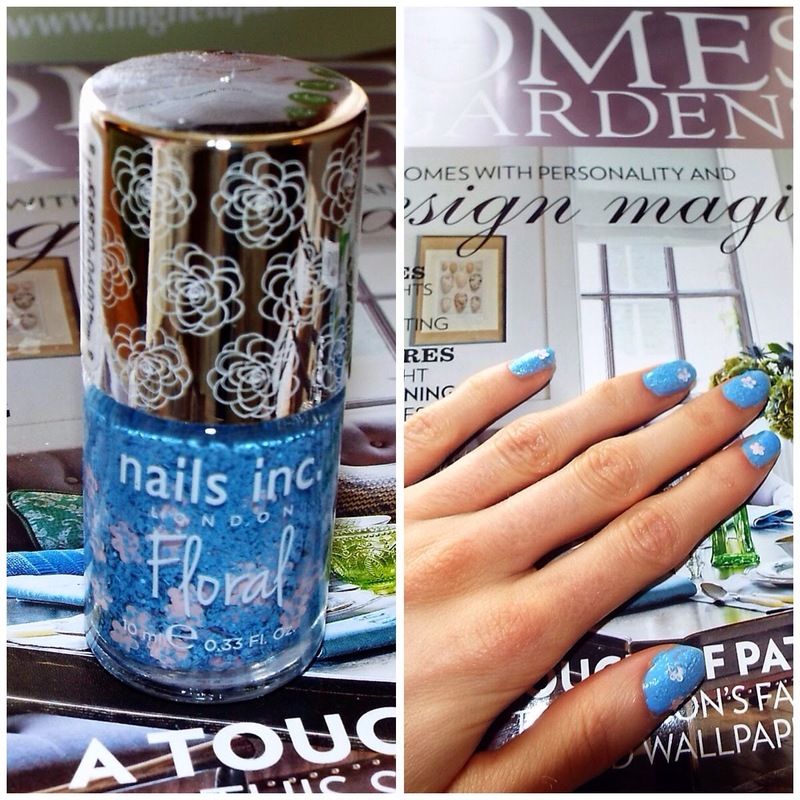 It's the beautiful nails inc Floral nail polish in shade queensgate gardens! These polishes are new out, in their floral range. I got mine by pre-order but I think they are available to buy for £12. As you can see it's got blue little strands and little pink flowers in a clearish gel. You apply this over another nail polish of your choice. I chose a blue colour, for the undercoat as I thought it emphasises the pretty pink flowers, but this would suit many colours. I can't white to try it over white! It's absolutely lovely and definitely perfect for a floral spring! It just makes me wish the sun would come out again! The only little issue I have is, that it's a bit tricky to get the flowers out of the bottle! but at the same time it's quite fun, because you're literally fishing for flowers to come out on the wand! I can't wait to try the other floral nail polishes in their range because this one is super super cute and pretty and great quality. So if you're after a polish like this I definitely recommend it! Come and join in on the flower power! 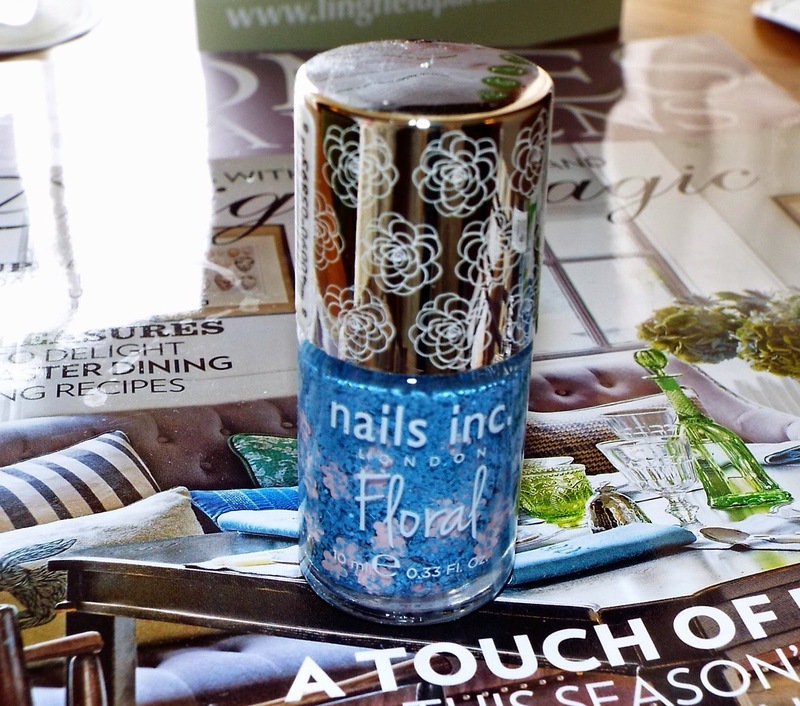 Have you tried nails inc floral nail polishes yet? I hope you're well! It's the end of the week, but the month's just beginning! And for a new month I decided to join Instagram! So if you're on there, I would love it if you followed me via my button on the side or by searching for luci_lheart I would also love it if you left me your Instagram usernames as I always love looking at beautiful pictures! 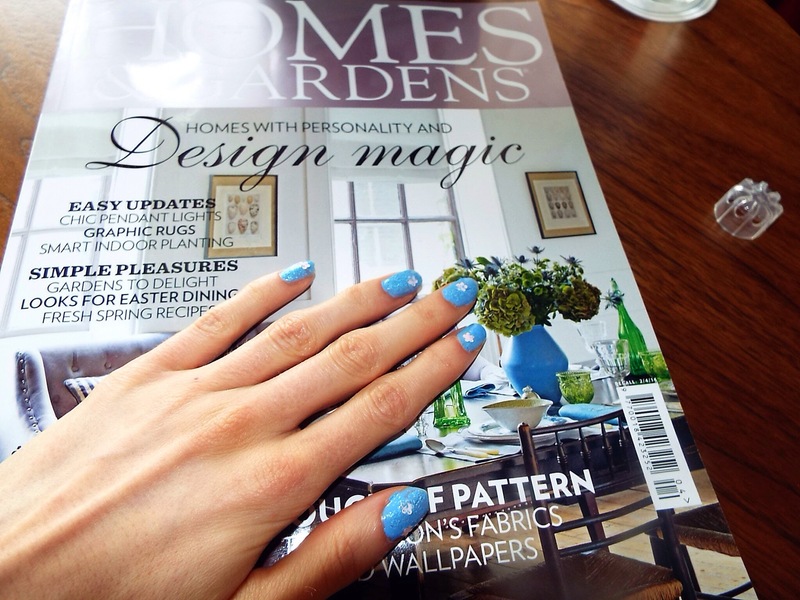 Even though I'm finding it hard to believe we're in April already, this new month means a new magazine issue! Yay! The other day I snapped up the latest issue of InStyle magazine! And the best bit is the freebies it came with! 15% off at Topshop is always a winner, but what was even better was the free pair of 'Eyeko Blue Velvet Lash Curlers' it came with and these curlers usually retail at £12! Quite some saving for a magazine which only costs £3.90! These curlers, I'm not sure if the exact same ones (but I think they might actually be) are available in Selfridges! I have seen them there so it's definitely true! Now normally with magazine purchases, they either give you mini versions of the product or a unique magazine only sample. 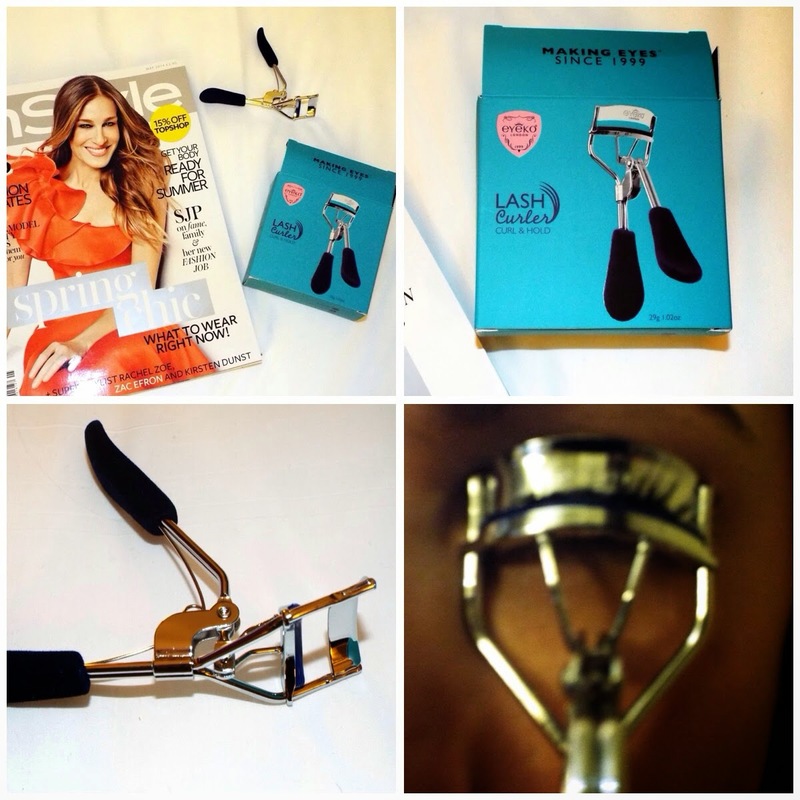 But no these are not mini lash curlers! They're the real deal! And when I say the deal, I can assure you they are complete winners in my eyes! I went through a phase years ago where I used eyelash curlers daily but then my old trusty GOSH ones broke so for years I went lash curler free. About a month ago, I purchased a pair from Topshop and although I was happyish with them, I now wish I hadn't bothered, because these Eyeko ones are amazing! You slot your eyelashes through, close to the root and then squeeze down gently. Then voila as if by magic you have beautifully curled lashes! In my eyes, the result is incredible. 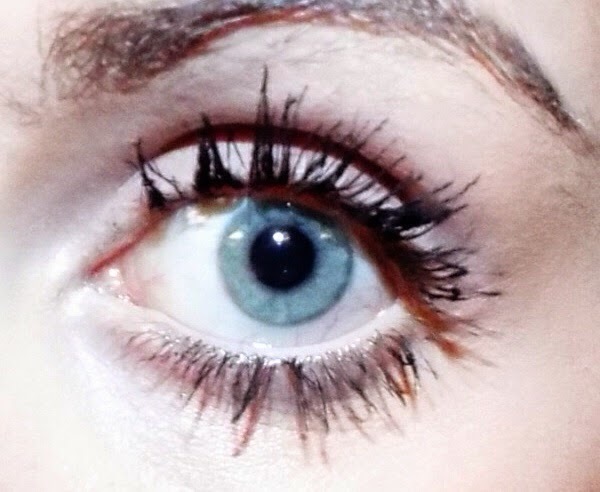 Here's my lashes, with a coat of mascara! They usually do tell you to put your mascara on afterwards, but sometimes, well quite often I'm a bit of a rebel and curl after mascara, it can make your eyelashes a bit clumpy, but they won't all fall out! I am quite blessed with long eyelashes, but I reckon these work well on short lashes too, because I attacked my mums lashes (which are shorter than mine) and they still curled well! For a freebie this is fantastic, so if you're after some of these! Go run and get InStyle magazine this month because for me it's a no brainier!